Watch the video above for the full breakfast seminar on Opportunities in Petrochemical Manufacturing. On April 19, 2017 The Southpointe Chamber of Commerce held an informative breakfast seminar featuring Denise Brinley, Assistant Secretary of Strategic Industry Initiatives for the Pennsylvania Department of Community & Economic Development, and Michelle Mcgregor, Senior Advisor of Energy Programs for The Nature Conservancy. The seminar focused on business opportunities in Petrochemical Manufacturing in Pennsylvania in relation to the new Shell Cracker plant as well as future developments. Below you will find a link to the full report that was referenced in the seminar. IHS Markit is exclusively responsible for this report and all of the analysis and content contained herein. This report relies heavily on proprietary data collected on a regular basis by IHS Markit, by IHS Markit’s proprietary models and analysis, and by secondary data provided by various US government agencies supported by interviews with industry representatives and other experts. 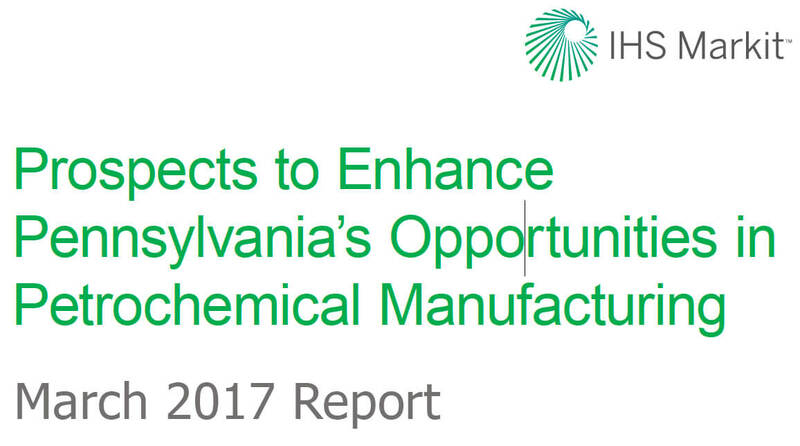 The scope of research was limited to the two primary components of NGL (ethane and propane), and how these two products could be used to enhance manufacturing opportunities in the Commonwealth of Pennsylvania. runs and most of the NGL production in the United States is sourced from natural gas. 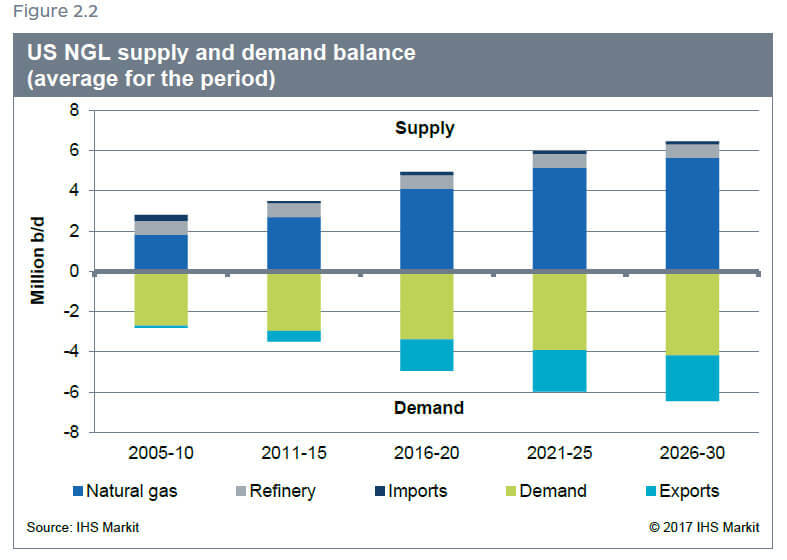 Figure 2.2 shows the current and significant forecast changes in the NGL supply and demand balances through 2030. NGL production from natural gas processing and refinery operations averaged about 3.4 million b/d between 2010 and 2015. With growing natural gas production, the total NGL production is estimated to nearly double—to average about 6.3 million b/d from 2026 to 2030 solely because of natural gas processing. In contrast, NGL production from refinery operations is not expected to grow through the rest of the forecast period. Imports of NGL have been declining since 2005 and will continue to decrease to minimum levels (some level of imports are required to balance the markets). The US demand for NGL is expected to grow, driven primarily by the feedstock needs of the petrochemical industry. 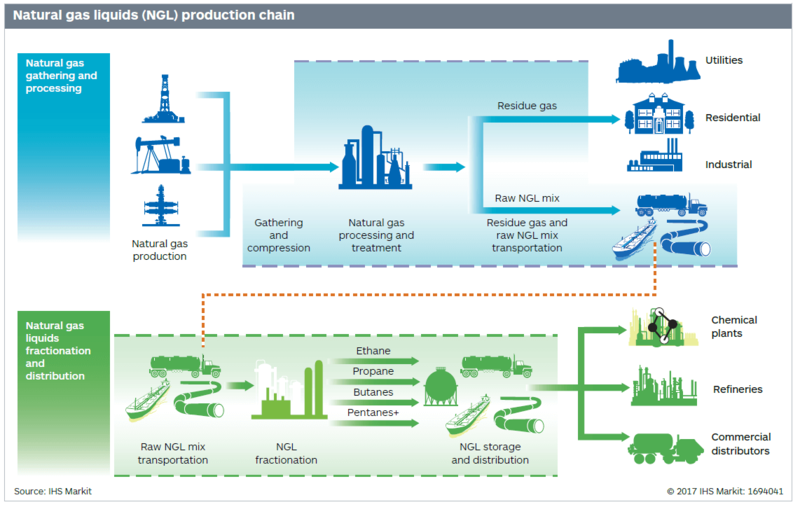 Demand for NGL in other sectors is expected to be flat to declining over the long term. The total demand for NGL from the various sectors in the United States will still not be enough to consume all of the NGL production, resulting in increased exports of NGL to international markets. Total exports from the United States averaged 0.5 million b/d between 2011 and 2015 and it is expected to average around 2.3 million b/d between 2026 and 2030. Interested in advertising? Click for more info.